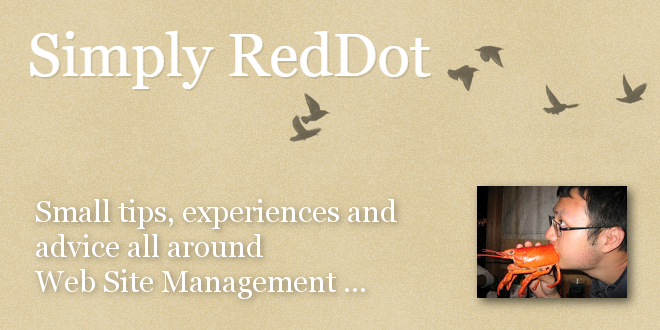 Simply RedDot: "Algorithm for Converting Old Navigation to Navigation Manager" - Open Text Web Solutions Usergroup e.V. This appears to be a frequently asked question for projects that are using the old list pull through container navigation method (the one with a connector page with a list and a container insider another container), so I am going to give out the algorithm I use. Go into navigation manager, in the right pane, right click, click "disconnected pages" and then right click, "import pages"
Go into navigation manager, in the right pane, right click, click "disconnected pages", find the root nood of your site, right click, "adopt page"
Old sites use the list container method so they can have separate publication package for each branch. Also, each branch’s landing page is named index.htm. These landing pages must be renamed or at least considered to avoid file overwrite. Also, one must set expectation with the customer that the publishing file path for landing pages will be different since all landing pages will share the same lst_navigation and publication package.